At a recent public forum, city leaders (including the police) heard the community’s concerns on policing, and a respected national authority on police training confirmed that the best practice for the Geneva Police Department is to implement some sort of civilian oversight. So how will our leaders respond? Noble Wray opened the ninety-minute event with an overview of implicit bias training and the importance of fair and impartial policing practices. The remainder of the meeting was dedicated to a question-and-answer session with Wray. Participants were given index cards and asked to write down their questions for Noble Wray, who answered many questions related to implicit bias, police-community relations and best practices. Several times, community members in attendance asked Wray for his professional opinion on a civilian advisory or citizen review board to provide accountability for the GPD. Mr. Wray made it clear that some sort of citizen advisory is considered a best practice, and therefore is recommended, for all police departments. For many in attendance, Mr. Wray’s support for civilian oversight was welcomed, as the community has been asking for such oversight since at least 2011. There were also many questions that Wray stated that he would be unable to answer, as those questions needed to be answered directly by the Geneva Police Department. And although Geneva Police Chief Jeff Trickler and several other officers were in attendance, they wouldn’t be answering any questions during the event. 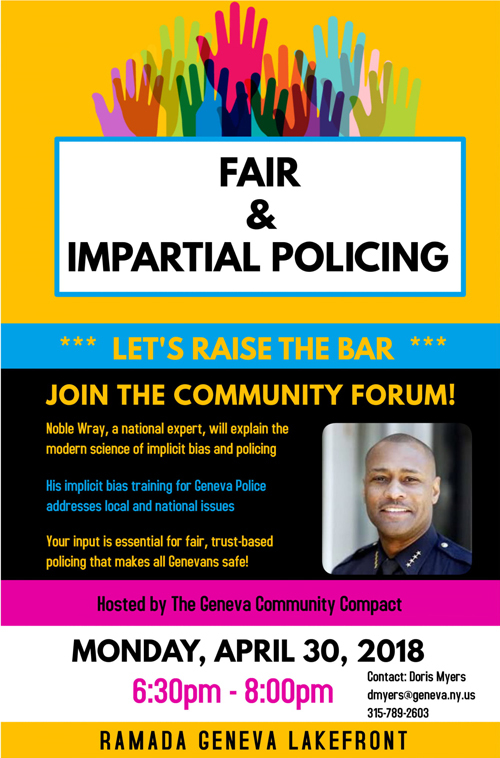 Many of the questions Wray couldn’t answer were related to the community’s experiences of unfair treatment by Geneva Police. Each time one of these questions was asked, the index card was put aside, and attendees were told that the Geneva Police would be answering all questions at a later date, and those answers would be shared publicly by the city. Then, one citizen inquired about the practice of using undercover officers from other jurisdictions for investigations in our city. Suddenly, Chief Trickler piped up and enthusiastically answered the question. Attendees has been told that the Geneva Police officers would not be answering questions, but this clearly wasn’t the case, at least when the question was an easy one to answer. So, what happened to all those questions the GPD didn’t answer? Specific questions were asked of Chief Wray, Geneva Police Department and Community Compact stakeholders. Each of the questions are currently being worked on. Once those questions and answers are compiled, they will be posted on our website. And how long is the city going to make the people wait for those answers? The questions that were taken at the community forum will have answers by the end of June. One of the biggest takeaways from the community forum was that communication between the GPD and residents needs improvement. And now the GPD will take two full months to answer questions that they wouldn’t answer, face to face with the community, in a public forum. This unnecessary delay will this allow the GPD to carefully craft their responses for maximum public relations impact. The emotional urgency of the event in the public’s mind will have begun to fade when the answers are finally revealed. It would seem that city leadership has no objections to the GPD’s evasiveness and lack of urgency related to that stack of index cards. That stack of index cards is a powerful testament to the fractured relationship between the police department and community members who were compelled to go to the Ramada on a Monday night and write down the stories of their deeply personal and painful interactions with the GPD, with the expectation that their questions would be answered promptly and honestly. At the May 2, 2018 City Council meeting, four of the five Councilors who attended the April 30th community forum gave their thoughts during Council reports. Councilor-At-Large Mark Gramling gave an overview of what was covered during the two-day training, and said “it was awesome to be able to sit there with local law enforcement to see their reactions.” Gramling did not mention the community forum and did not mention Wray’s statements about civilian review. Ward 1 Councilor Angelina Marino (who has her own history with the GPD) offered an empty, monotone fifteen second statement, saying that she believed the community forum was “very valuable” and that she was “happy to see” other councilors in attendance. However, Wray actually said that one of the concerns for a police department is that they might feel “micromanaged” by a civilian advisory, but Wray was quick to add that if Geneva could find the “sweet spot” between citizen oversight and micromanaging of the police, a civilian advisory is, in fact, the best practice. D’Amico went on to voice his support for the creation of an ombudsman, who would act as a liaison between the community and police. Wray did say that adding an ombudsman would be considered best practice, but Wray never implied that it was the only best practice step the city should take. Camera continued that he and D’Amico “both think (an ombudsman) is a great idea. Somebody to shepherd the complaint through the process” so that complainants don’t have to feel intimidated when filing a complaint. Councilor-At-Large Gordon “Gordy” Eddington attended the forum but was absent from the May 2, 2018 City Council meeting. Even after the community forum, city leaders are still refusing to hear what the community is saying. The community is saying they are being treated poorly by the police, their complaints are not being taken seriously, and that the police need civilian oversight. City leadership is responding by offering residents the opportunity to make their complaint through a third party. This change has nothing to do with adding accountability or oversight. The message from city leadership is that the police don’t need to make any changes to improve the complaint process, and that complainants are either misinformed about police policy and procedure or intimidated by the complaint process. Perhaps the strongest statement during the public forum from Noble Wray in support of civilian oversight was his experience with the Police and Fire Commission of Madison, WI, where Wray served as police chief for nine years. Wray said that because the Police and Fire Commission had the authority to fire him, he listened to them. A citizen advisory mechanism, if done effectively, can build trust between the police and the community that is based on transparency, fairness and accountability. From 2002 to 2015 only 2 percent of civilian allegations of “excessive force” have been “sustained” — or found to be likely true — by the department’s police chief while 5 percent were upheld by the Civilian Review Board. From 2008 to 2013 the Rochester Police Department’s Professional Standards Section (the PSS, which is the equivalent of an internal affairs division) did not uphold any civilian complaints of unnecessary use of force. 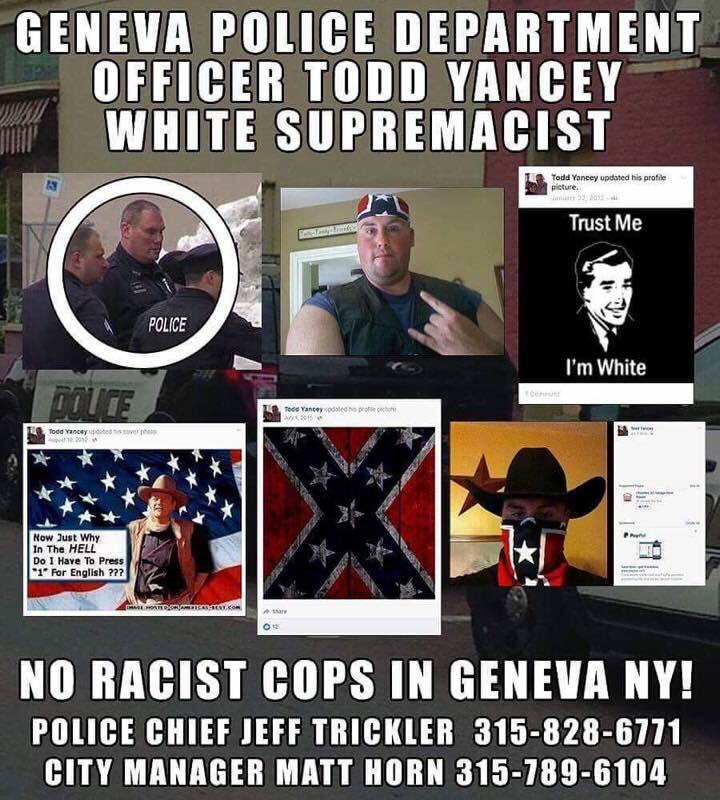 Social media posts from current Geneva Police officer. City leaders have never updated the public on the internal investigation underway since September 2017. Contact City Council and tell them that the people want real civilian oversight of our police department. Previous GPD Update: New Police Chief On The Horizon?